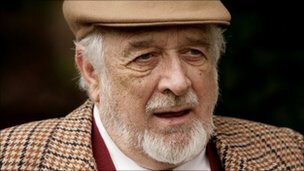 Yesterday, Nicholas Courtney passed away after a short illness related to cancer. 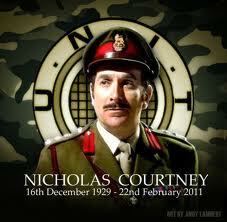 For years, and alongside five different Doctors (although most famously and consistently with the 3rd Doctor) Nicholas Courtney played UNIT officer and erstwhile friend of the Doctor, Brigadier Lethbridge-Stewart. He was 81. If you've watched any classic Who, especially any of the 3rd Doctor episodes (some of the best in the series, in my opinion), you might be familiar with the character. He was very capable and had his own ideas of how problems needed to be handled. This could often lead to situations where the Doctor and the Brigadier butted heads, and yet it was clear that the characters had a great deal of respect for each other. He has long been one of my favorite characters in the long history of the show, and I hoped that with the reemergence of the show and the occasional appearance of UNIT that Courtney would reprise his role on NuWho. While that never happened, he did get to appear as the Brig one last time on the spin off series, The Sarah Jane Adventures. The Doctor Who Universe lost a great man today. My thoughts and prayers are with his family in this difficult time. He will be missed.